It should have surprised nobody that Pyongyang would seek to capitalize on South Korea’s desire to host a positive, peaceful and perhaps even profitable Winter Olympics in Pyeongchang next month. Kim Jong-un’s New Year’s Address was like death and taxes: predictable. The North wants to refashion the dynamic of international relations in Northeast Asia — if only for a while — now that the law of diminishing returns on raised tensions has kicked in, and other actors are arrayed against it and its scheme to become a full-fledged nuclear state (albeit each with a different degree of fire and fury). Both North and South Korea have agreed to march their Olympiads under a single flag at the opening ceremony to the Pyeongchang Winter Olympics, which will be attended by a North Korean delegation, and to field a joint women’s ice hockey team. 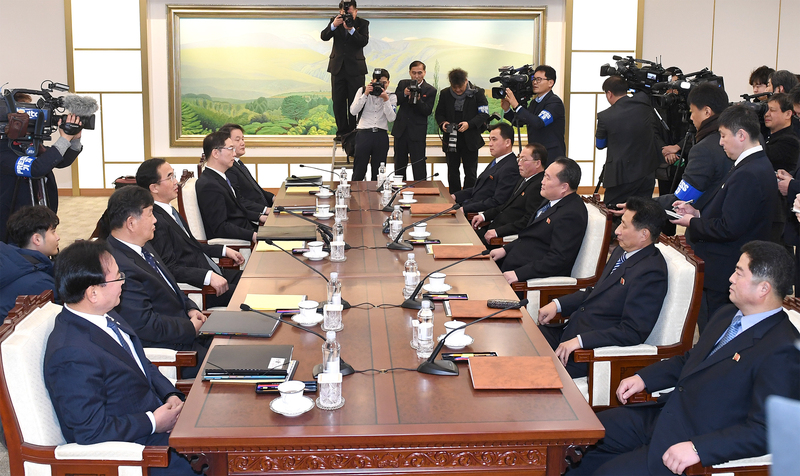 These agreements, including a commitment to military-to-military talks, are what follows from the first official dialogue between the two Korea on January 9. South Korean President Moon Jae-in’s choice to take up Kim Jong-un’s New Year’s Day speech overture for talks provides a welcome reprieve for South Koreans and the world; recent talks of war have alarmed even the casual observer. Inter-Korean dialogue should be welcomed, especially if it reduces the likelihood of miscalculation or provocation. However, the significance of recent moves should not be overstated, nor should great expectations be placed on President Moon to transform the region or inter-Korean relations. President Moon, a liberal with a mandate to improve the economy and restore trust in a political system that recently underwent a highly contentious impeachment process, doesn’t have the kind of political support necessary to pursue a transformative North Korea policy. Anything more than cultural exchange, high-level dialogue, or efforts to reunite families separated by the Korean War are unlikely to succeed because the electoral coalition Moon banks on supporting his administration and party (the ruling Minjoo Party) does not prioritize North Korean affairs. To be certain, Moon is popular. There is no doubt about that. It’s still early in his presidency, but major polls put his approval rating in the upper 60s or higher, despite small but notable dip since North-South talks began. Popularity is a necessary (but certainly not sufficient) condition for directing policy change. But we are a long-time divorced from the early 2000s, when previous liberal governments pursued an ambitious and wide-ranging engagement policy towards North Korea, known as the Sunshine Policy. Moon’s base of support consists of young South Koreans with little time for North Korea and centrists who are already uncomfortable with the idea of engaging North Korea. None of this is to say that Moon won’t get support from his base for détente lite. He has long advocated for dialogue over isolation. High-level talks and sports diplomacy aren’t at odds with what his base is willing to support. Indeed, the recent conciliatory gestures are consistent with what was expected from a Moon administration. It’s worth remembering, however, that denuclearization has been from the get-go a center piece of the administrations’ foreign policy and vision for the region. Less reported from the January 9 dialogue is the “strong complaint” filed by North Korea after the South raised denuclearization. There is little to lose in cultural exchanges of the sort we will see next month for the Olympics, and high-level talks can help diffuse unwanted tension, even though they won’t resolve the nuclear issue. These are politically safe moves, in other words, but aren’t expected to precipitate a complete political thaw or something greater. Indeed, data suggest no one expects – or for that matter, demands — significant changes. A Gallup Korea polling report following Kim Jong-un New Year’s day speech, during which he made an overture to participate in the Olympics and seek talks with South Korea, found that only 28 percent of South Koreans had changed their attitudes towards North Korea. This is consistent with responses following similar events. In 2014, following high-level meetings and a reunion of separated families only 25 percent said their attitudes had change, said the same report. After a high-level delegation from North Korea attended the Incheon Asian Games closing ceremony later that year, still a meagre 28 percent had changed their minds. Following Moon’s election, some had hoped and a few expected his administration to pursue a revised Sunshine Policy, or at least something approximating the foreign policy towards North Korea by the two previous liberal governments. Under the Sunshine Policy, South Korea sought a warming of inter-Korean relations through substantive economic aid, tourism, and cultural exchange. The idea was that, through engagement, North Korea would slowly open its doors to the world, or at least South Korea. The policy’s effectiveness is a matter of debate, but if the objective was to normalize inter-Korean relations and bring long-lasting peace to the region, then the policy ultimately failed. Whether one wishes for its return or not, Sunshine is over. Times have changed on the Korean peninsula, and so too have South Korean attitudes towards North Korea. 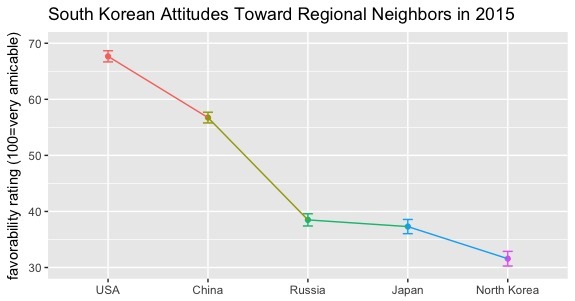 The Korean Identity Survey, run jointly by the East Asia Institute and media partners, has tracked South Koreans attitudes towards its neighbors since 2005. The survey data show a downward trend in North Korea’s favorability rating. In 2015, North Korea was ranked as the least favorable among regional actors. The explanation for this is rather simple: North Korea is perceived to be a threat to the livelihoods of South Koreans. The goodwill shown during the Sunshine years is no longer. The sight of North and South Korean athletes walking side-by-side under a unified Korean flag will be symbolically rich and emotionally significant as a reminder of Korea’s unfortunate division, but inter-Korean solidarity among the South Korean populace is relatively low. Attitudes among younger South Koreans — those in their 20s and 30s — show little promise. Not only are than less than enthusiastic about North Korea, they increasingly see themselves as nationally distinct. This interesting development, an increasingly popular subject in new scholarship on contemporary South Korea, centers on the foundational element in unification policy — that South and North Koreans are a divided national population, and understood as such. However, what it means to be “Korean” for South Korean millennials – worldly, digitally connected, and “modern” in dress and temperament — excludes North Koreans. Accordingly, feelings of inter-ethnic closeness and support for national reunification are lowest among younger South Koreans. In fact, increasingly critical attitudes towards North Korea and lackluster support for unification are one of the few dimensions on which older and younger South Koreans agree. 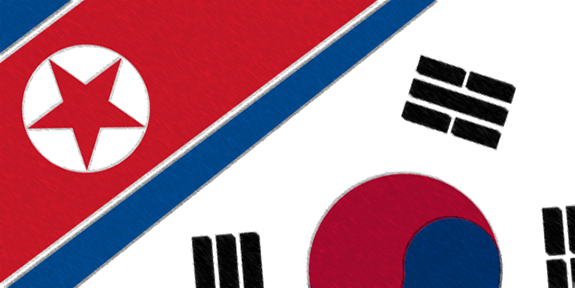 The longer Korea remains divided, the more entrenched the feeling of separation. That unification is estimated to cost of upwards of $1 trillion or more doesn’t help, either. Moon will continue to thread the needle and seek to manage the volatile geopolitical situation in the region. He will likely seek sustained dialogue with the North and, barring a major policy shift, also continue to insist on denuclearization of the Korean peninsula as a primary goal of his administration. His base of support demands no more, and no less. While this may help keep tensions at a tolerable level, it isn’t likely to bring about significant change. Optimism is fine, and hope springs eternal, but let us swear off bold and unrealistic predictions.